The heritage of Southern Cebu is wonderful! That's why in pains me to see so much of it desecrated in recent years. Let me warn you that as I introduce the wonderful heritage of Southern Cebu, I'll be ranting because of some stupid priests and local officials who have succeeding in uglifying the churches and other old structures. Southern Cebu's heritage trail usually begins in Oslob. But after the Oslob Church and convent burned down last year (obviously someone was negligent, leaving the convent in the wee hours of the morning; I wonder where father was when the church under his care burned down), we decided to start in Boljoon Church, a National Cultural Treasure and a candidate for UNESCO World Heritage if ever they do expand the inscription Baroque Churches of the Philippines. Sadly, it was raining when we got there so I couldn't take good photos of the facade. But at least this time, the restoration work on the retablo and ceiling was complete so I was able to take photos. They are still in the process of restoring the choirloft and pipe organ. 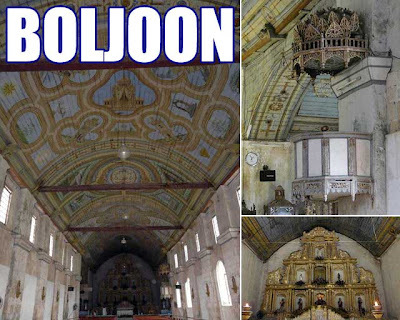 Boljoon is no doubt a wonderful example of how to preserve heritage the right way. 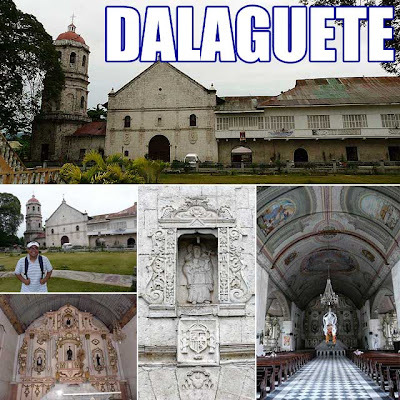 Our next stop was Dalaguete Church which I skipped the last time. Sadly, the parish priest was in the process of desecrating the old altar. Yes, this was heritage disaster number two for the day. He removed wooden altar panels and replaced it with a cheap and hideous marble structure which does not match the retablo. He also touched the centuries-old tiles in the altar. CBCP, where are you when we need you? Aside from that, the rest of the church is intact and worth visiting. I hope it remains that way. These priests waste church money on useless projects that desecrate heritage, doing more harm than good, just so that they could leave their mark, no matter how ugly. Such funds could have been used for the pastoral mission of the church! Anyway, we made our way to Argao, another sad story. The church and municipio comprise heritage disaster number three and four. The main altar of the Argao Church was desecrated by the monsignor of the church. What happened to Cardinal Vidal when his favorite monsignor converted the polychrome altar into the biggest trophy case in the Philippines? And he used latex paint on wood. So the damage is close to irreversible! Wonderful polychrome statues of the archangels were painted gold! Talk about Midas' touch! The Argao Municipal Hall is another sad story. We even featured it in the HCS calendar as a wonderful example of a Spanish colonial town hall with its clay tile roof still intact. Well, it's now a disaster since they sandwiched it in between two new buildings and bored holes on both sides to connect the new buildings to the original municipio. Not only that, they built a balcony in front. My God! Where do these mayors get their "bright" ideas? 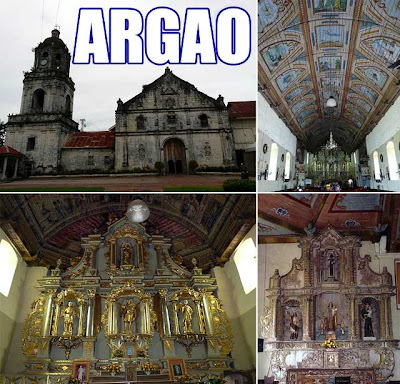 Argao could have been a UNESCO World Heritage site I was told. That's impossible now! Our last church for the day was Sibonga Church which I also skipped the last time. It's another wonderful church with ornate ceiling paintings. It doesn't have a retablo though. Of course, we already visted Carcar Church in the morning. The Carcar Church is another heritage disaster. Sigh! The priest and parish pastoral council built ugly pedestals for the angels they took down. The parish priest had previously taken down the angels which adorned the columns of the church, sparking an outrage from the townsfolk. But aside from that, the rest of the church is intact and grand! 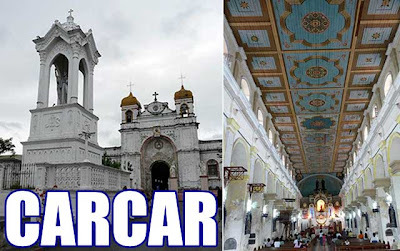 There are even more churches between Carcar and Cebu City. If you have time, you can pass by San Fernando, Naga, Minglanilla, Talisay and Pardo on the way back to Cebu City. My next target when I do visit Cebu again will be a visita iglesia in Western Cebu.